I remain convinced that such fears are overblown, and that China has the strategy, wherewithal, and commitment to achieve a dramatic structural transformation into a services-based consumer society while successfully dodging daunting cyclical headwinds. But I certainly recognize that this is now a minority opinion. For example, US Treasury Secretary Jacob J. Lew continues to express the rather puzzling view that the United States “can’t be the only engine in the world economy.” Actually, it’s not: the Chinese economy is on track to contribute well over four times as much to global growth as the US this year. But maybe Lew is already assuming the worst for China in his assessment of the world economy. So what if the China doubters are right? 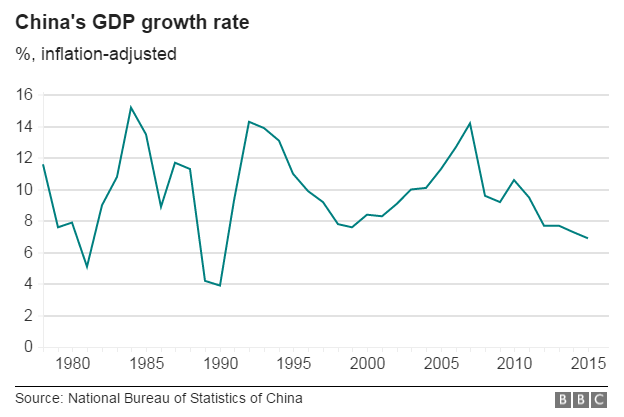 What if China’s economy does indeed come crashing down, with its growth rate plunging into low single digits, or even negative territory, as would be the case in most crisis economies? China would suffer, of course, but so would an already-shaky global economy. With all the handwringing over the Chinese economy, it’s worth considering this thought experiment in detail. For starters, without China, the world economy would already be in recession. China’s growth rate this year appears set to hit 6.7% – considerably higher than most forecasters have been expecting. According to the International Monetary Fund – the official arbiter of global economic metrics – the Chinese economy accounts for 17.3% of world GDP (measured on a purchasing-power-parity basis). A 6.7% increase in Chinese real GDP thus translates into about 1.2 percentage points of world growth. Absent China, that contribution would need to be subtracted from the IMF’s downwardly revised 3.1% estimate for world GDP growth in 2016, dragging it down to 1.9% – well below the 2.5% threshold commonly associated with global recessions. Of course, that’s just the direct effect of a world without China. Then there are cross-border linkages with other major economies. The so-called resource economies – namely, Australia, New Zealand, Canada, Russia, and Brazil – would be hit especially hard. As a resource-intensive growth juggernaut, China has transformed these economies, which collectively account for nearly 9% of world GDP. While all of them argue that they have diversified economic structures that are not overly dependent on Chinese commodity demand, currency markets say otherwise: whenever China’s growth expectations are revised – upward or downward – their exchange rates move in tandem. The IMF currently projects that these five economies will contract by a combined 0.7% in 2016, reflecting ongoing recessions in Russia and Brazil and modest growth in the other three. Needless to say, in a China implosion scenario, this baseline estimate would be revised downward significantly. The same would be the case for China’s Asian trading partners – most of which remain export-dependent economies, with the Chinese market their largest source of external demand. That is true not only of smaller Asian developing economies such as Indonesia, the Philippines, and Thailand, but also of the larger and more developed economies in the region, such as Japan, Korea, and Taiwan. Collectively, these six China-dependent Asian economies make up another 11% of world GDP. A China implosion could easily knock at least one percentage point off their combined growth rate. The United States is also a case in point. China is America’s third-largest and most rapidly growing export market. In a China-implosion scenario, that export demand would all but dry up – knocking approximately 0.2-0.3 percentage points off already subpar US economic growth of around 1.6% in 2016. Finally, there is Europe to consider. Growth in Germany, long the engine of an otherwise sclerotic Continental economy, remains heavily dependent on exports. That is due increasingly to the importance of China – now Germany’s third-largest export market, after the European Union and the United States. In a China implosion scenario, German economic growth could also be significantly lower, dragging down the rest of a German-led Europe. Interestingly, in its just-released October update of the World Economic Outlook , the IMF devotes an entire chapter to what it calls a China spillover analysis – a model-based assessment of the global impacts of a China slowdown. Consistent with the arguments above, the IMF focuses on linkages to commodity exporters, Asian exporters, and what they call “systemic advanced economies” (Germany, Japan, and the US) that would be most exposed to a Chinese downturn. By their reckoning, the impact on Asia would be the largest, followed closely by the resource economies; the sensitivity of the three developed economies is estimated to be about half that of China’s non-Japan Asian trading partners. The IMF research suggests that China’s global spillovers would add about another 25% to the direct effects of China’s growth shortfall. That means that if Chinese economic growth vanished into thin air, in accordance with our thought experiment, the sum of the direct effects (1.2 percentage points of global growth) and indirect spillovers (roughly another 0.3 percentage points) would essentially halve the current baseline estimate of 2016 global growth, from 3.1% to 1.6%. While that would be far short of the record 0.1% global contraction in 2009, it wouldn’t be much different than two earlier deep world recessions, in 1975 (1% growth) and 1982 (0.7%).